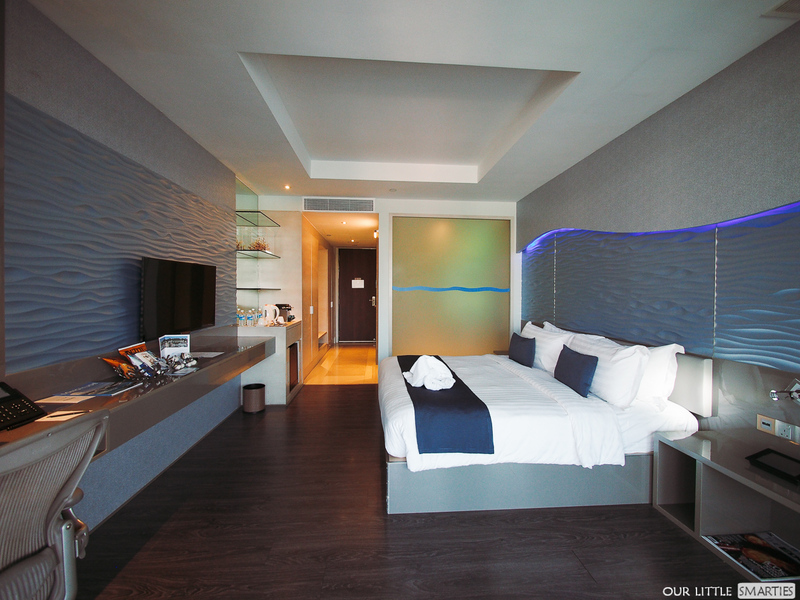 For instance, there are 26 nautical-themed rooms and suites with spectacular views that you can book. 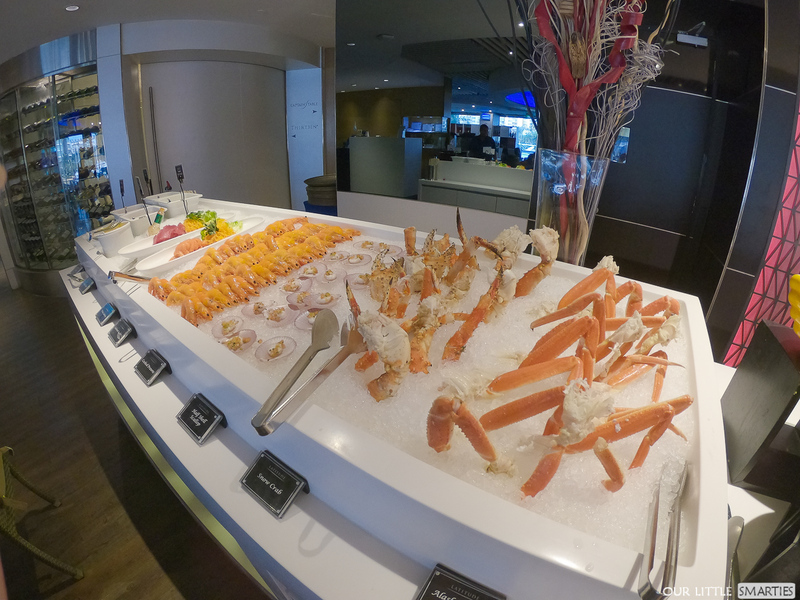 WOK°15 Kitchen, touted as “Singapore’s Top Restaurant” by Wine & Dine, features fresh live seafood for selection from the aquarium, classic Cantonese cuisines, a la carte steamboat dinner buffet as well as dim sum buffet on weekends. There are other restaurants and bars that are opened to the public too. 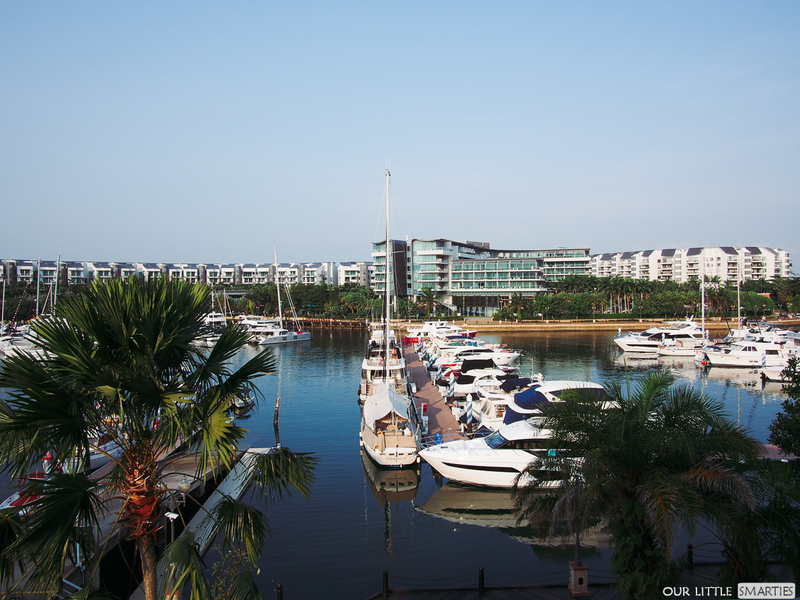 We’ve been to Sentosa Cove several times but this was our first visit to ONE°15 Marina. The moment we arrived, we were amazed by the wonderful view of the marina. And much to our surprise, the club is very kid-friendly too. 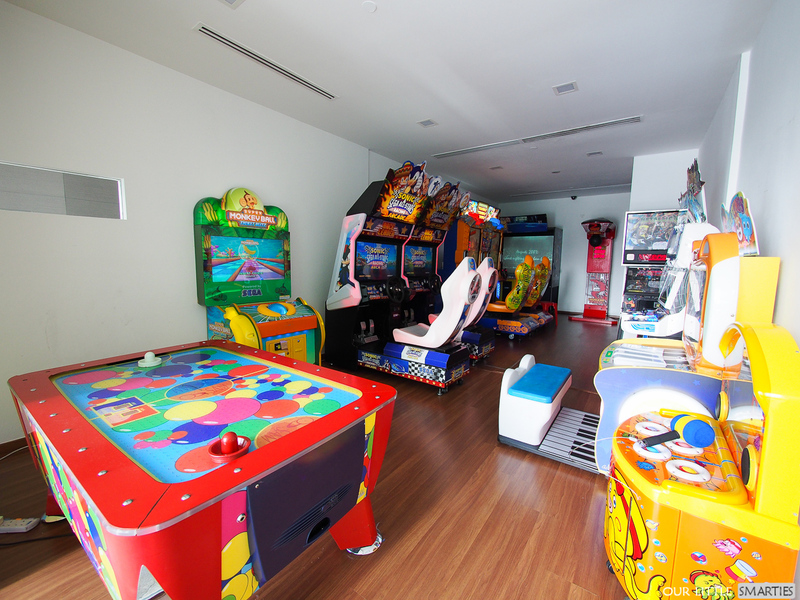 There is a playground, air-conditioned playroom, games room, an infinity pool, bicycle rentals, tennis court and table tennis court (more on that later! ). It’s safe to say that kids will enjoy the stay here more than their parents, and I’m saying a lot more. Hahah! 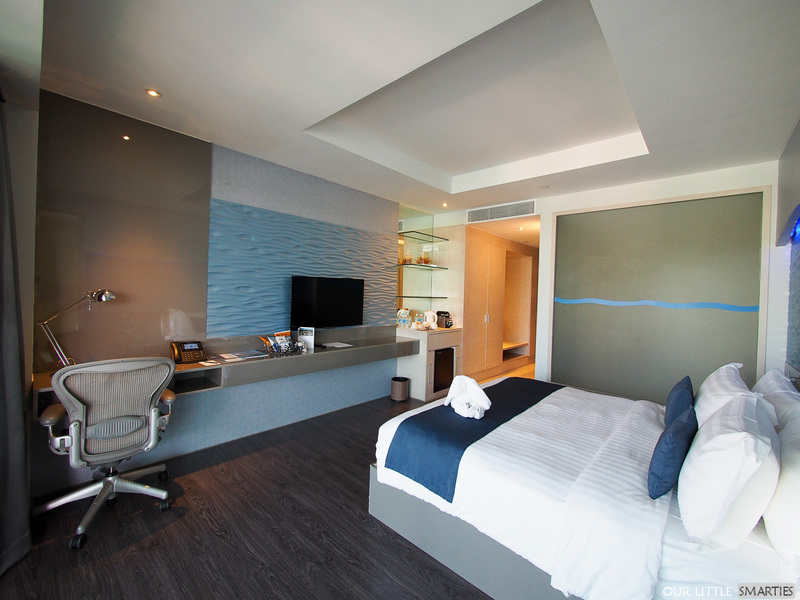 There are four room types at ONE°15 Marina Sentosa Cove – Hillview, Marina View, Marina Family and Monte Carlo Suites. These rooms feature amenities and fittings such as memory foam pillows, Nespresso coffee machines, cable television, spacious bathrooms, a sunken bathtub, and skylight windows. 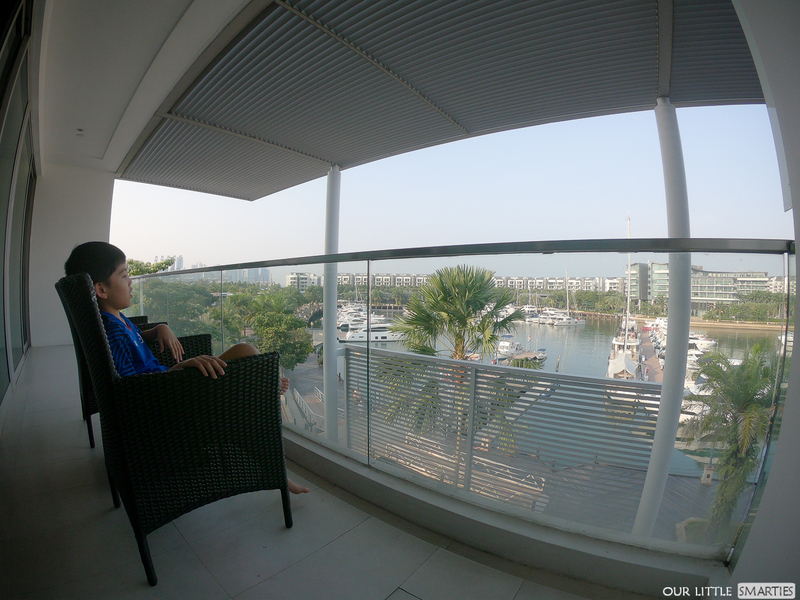 We stayed in a Marina Family Room that comes with a whopping size of 50 sqm. 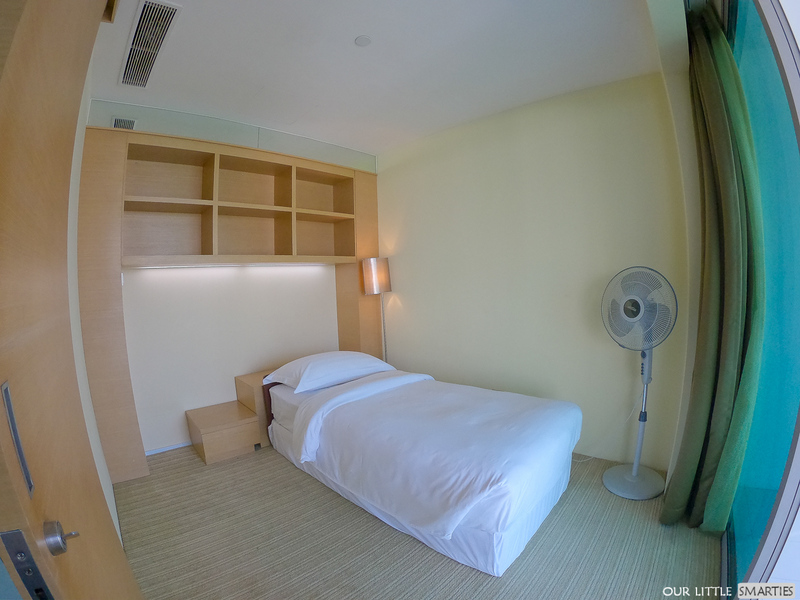 Designed with families in mind, this spacious room is equipped with a Queen Size bed and a Super Single bed. 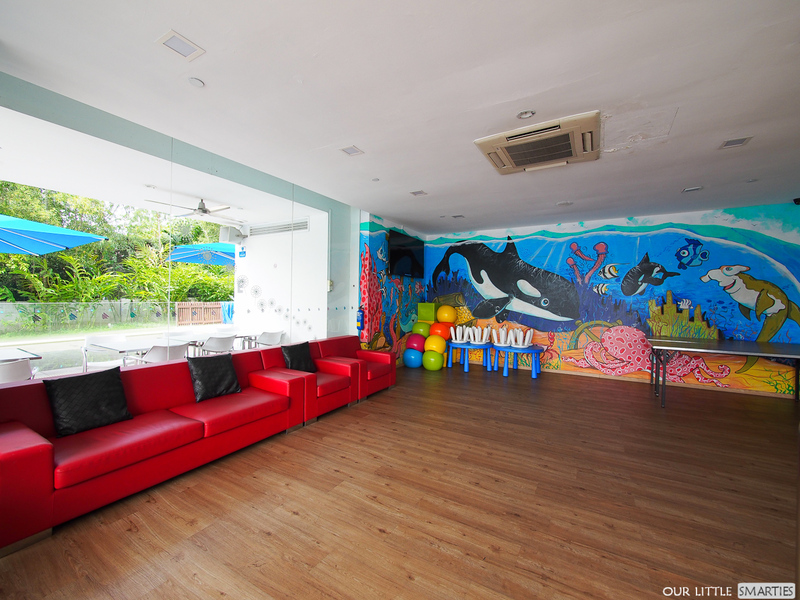 It can accommodate up to 3 adults or 2 adults and 2 children. The open balcony is my favourite part of the room. I love to stand here and enjoy fresh air while admiring the beautiful view of the marina. V was delighted to find that the 40” Cable LCD TV has several cable channels, while I was happy with the complimentary WIFI speed that allows me to catch-up on my K-dramas. In addition, the room is pretty “smart” too. 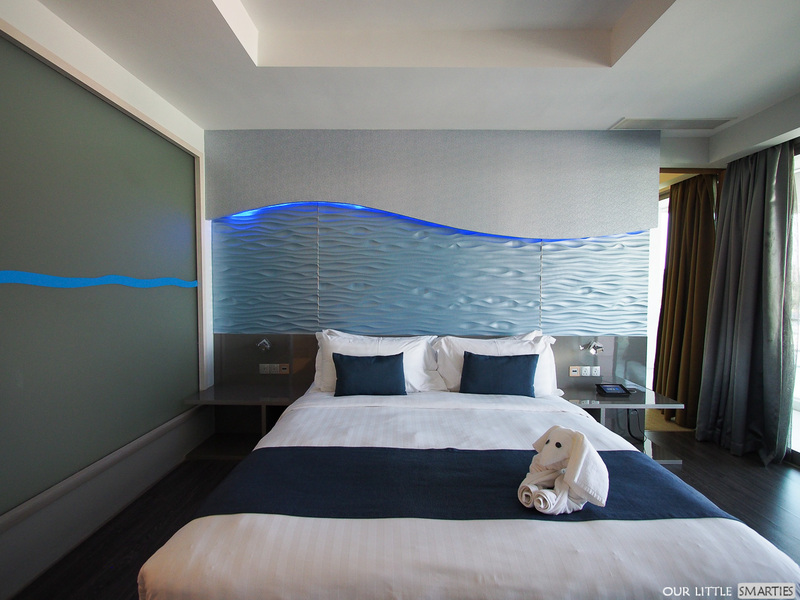 There is a control panel on the bedside that allows you to control everything from the air-con settings to the curtains and lights throughout the room. You never have to leave the bed in order to get things done, LOL! The bed itself is very comfortable, not too hard and not too sort – just nice for my likings. Coupled with memory foam pillows, they give me a good night’s sleep. The kid’s sleeping area is separated from the parents by a sliding door for privacy. This is a very thoughtful gesture, as you know, parents and kids do need their own quiet times. As mentioned earlier, tea and coffee-making facilities are available in the room. 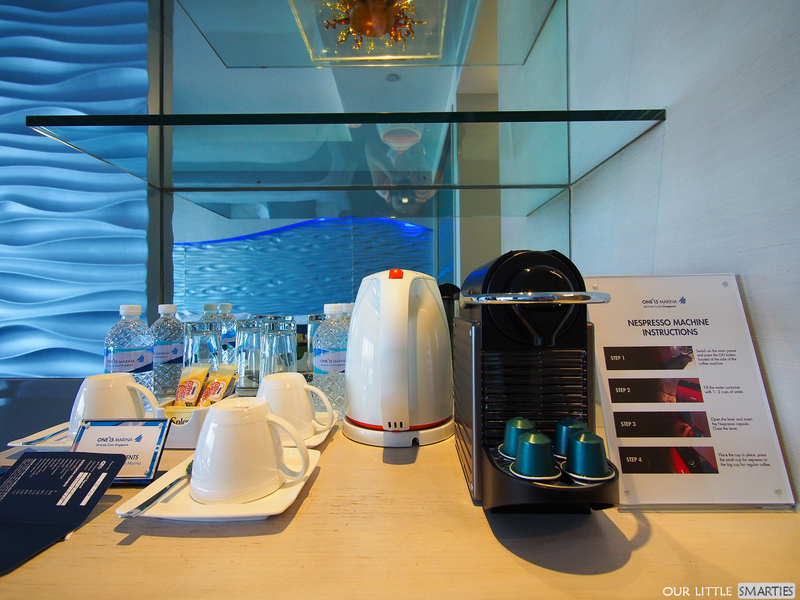 I was so impressed to see a Nespresso machine here (even some five-star hotels do not provide). Teabags are provided in case you prefer tea to coffee. There is a minibar with drinks as well as snacks. During check-in, we were also given a voucher booklet that contains discount vouchers to be used at the restaurants, bars as well as recreation center. For instance, 1-for-1 on bicycle rental, 25% off dinner buffet at Latitude Bistro, etc. Now, let’s take a look at the bathroom. 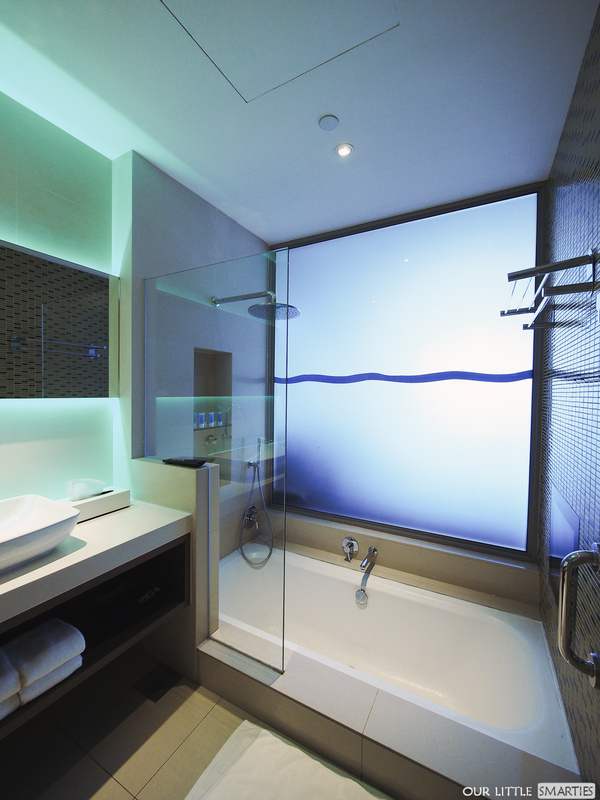 There’s a sunken bathtub with a built-in LCD TV!  Wow! 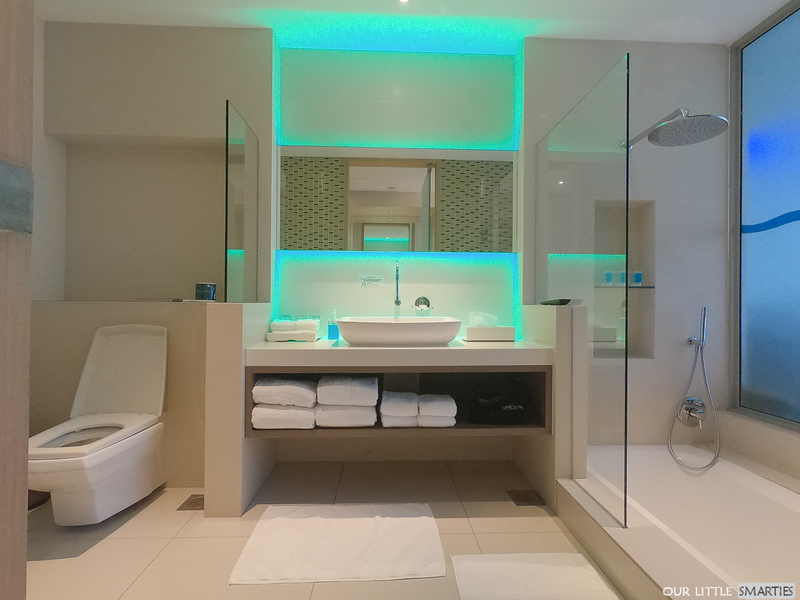 You may have noticed the mood-lighting on the sink and the rain shower too. Imagine yourself soaking in the relaxing bathtub while watching your favourite TV program. This is indeed a super pampering experience. 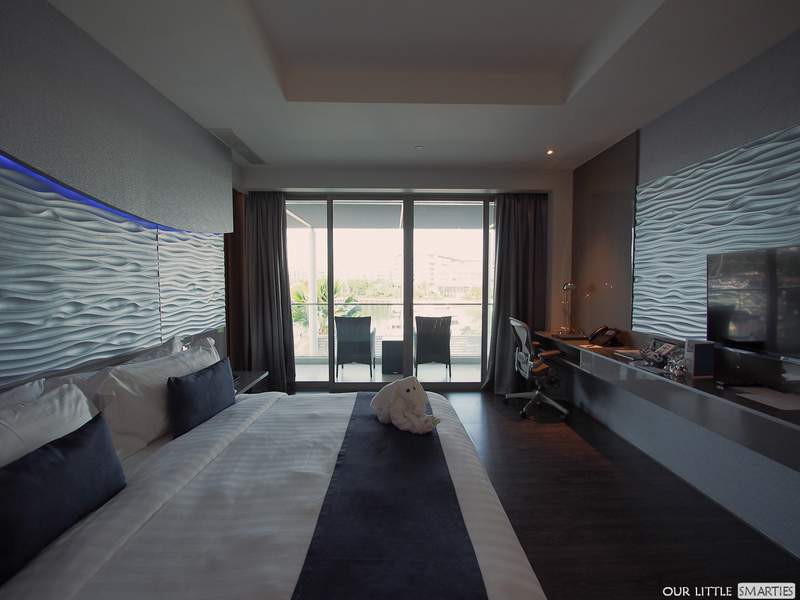 Overall, I’m  impressed that ONE°15 Marina Sentosa Cove offers such a high quality in-room experience. Moreover, I didn’t expect the room to be so luxurious and spacious. It truly exceeds my expectations. More often than not, when we book a staycation, we’re worried about running out of activities to do. Fret not! There are plenty of activities to keep you and your family occupied during your stay at the club. We checked-in close to 6pm because Edison has a tuition lesson in the afternoon. It was quite late for a swim, so we took a leisurely walk around the club after we put down our luggage. Much to our surprise, we found ourselves at Quayside Isle in just a few minutes! We didn’t know that it was so near. 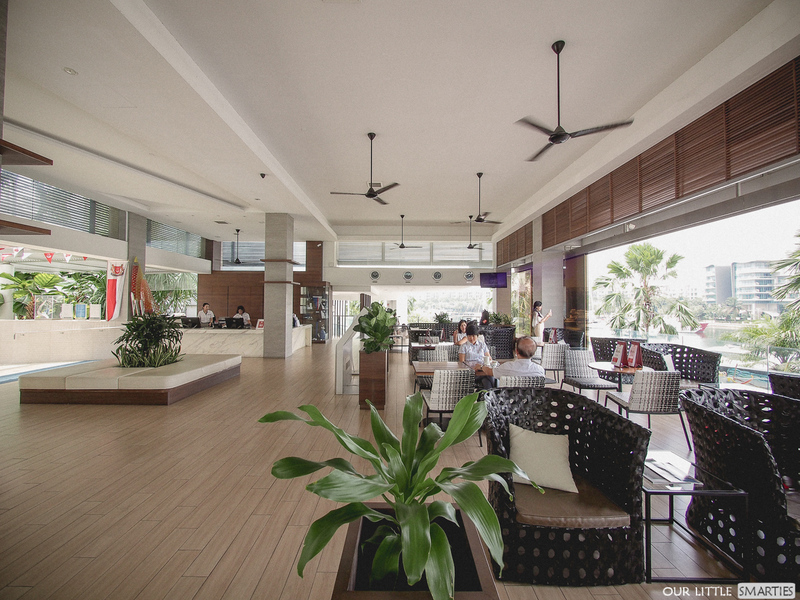 Sentosa Cove Village is located next to the club (just 3 mins walk). Here, you can find a Cold Storage and 7-11, in case you need to grab some snacks. 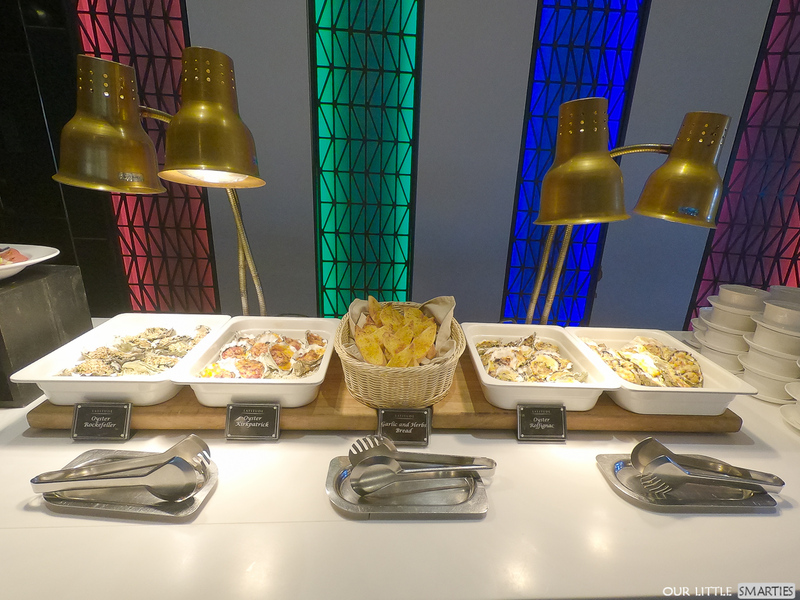 With the 25% discount voucher, we went to try out the American and Hawaiian Dinner Buffet at LATITUDE Bistro (more in the next section). After dinner, we headed to Boaters’ Bar that is located in front of the marina club. It’s a floating bar that serves drinks and bar snacks such as deep-fried wings, satay, burgers and pizzas. There’s a happy hour promotion – drinks at $5 all night for Half-Pint Beer / House Red & White / House Spirit. It’s open daily from 5pm – 11pm. Truthfully, it’s been a while since V and I sat at a romantic place like this to enjoy a pint of chilled beer. The views are no less impressive and the sounds of the glistering water that surrounds the bar make it even better. It was such a great night and I wish time would slow down. There is a poolside movie screening every first and third Saturday of the month with complimentary popcorns for room guests. Movie titles will be announced closer to date, so guests can follow their Facebook page to be updated before their stay. Healthy breakfast as a start of my day! The next morning, we woke up fairly early because we wanted to go for a swim at the infinity pool. Buffet breakfast is served at LATITUDE Bistro. It has an indoor and outdoor seating areas. There was a live egg station so I ordered an omelette and picked some of my favourites from the buffet spread. There was some piping hot dim sum, noodles, porridge, cold cuts, sausages, hash browns, bacon, cereals, breads and tarts, assorted fruits and juices. 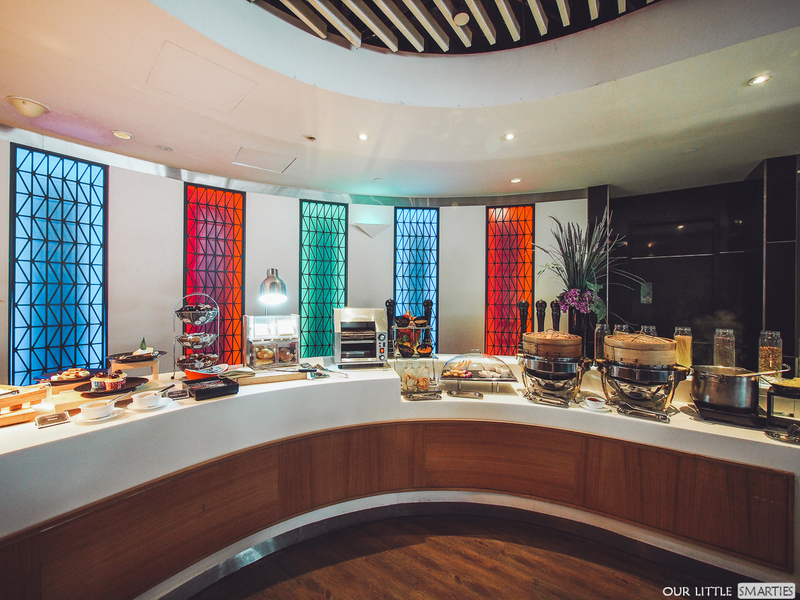 Other dining options in the club include WOK°15 Kitchen; Bar Nebula in the iconic Glass Tower specializing in imported beers, fine wines and champagnes; Pool Bar serving snacks by the pool and Helios 93, a lobby bar serving coffee, tea and food-on-the-go. 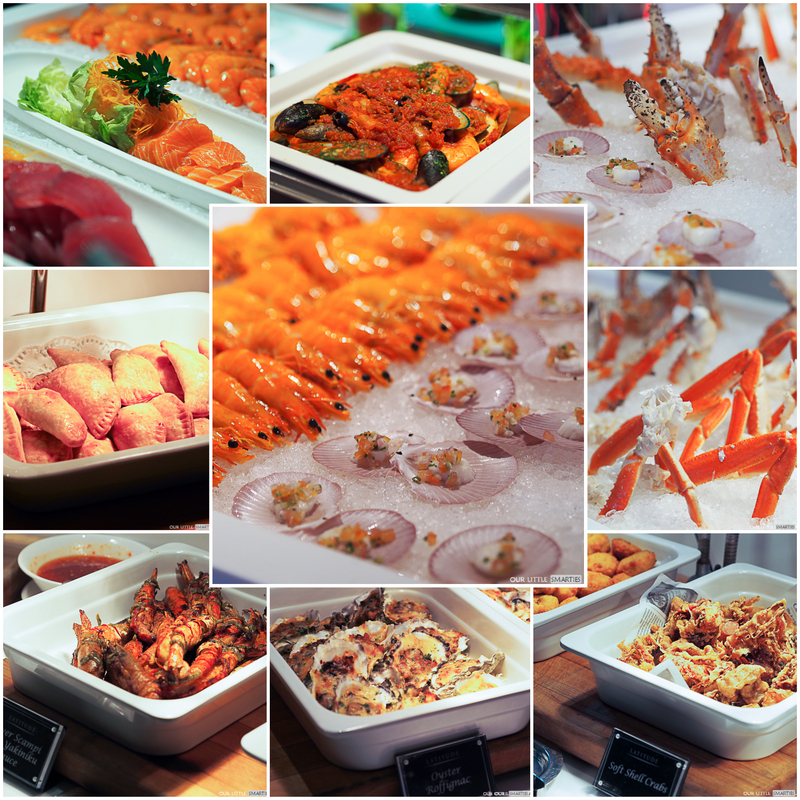 LATITUDE Bistro offers themed dinner buffet every Friday and Saturday, 6:30pm – 10pm at $48+ (Adult) and $24+ (Child). We made use of the 25% discount voucher to try out the buffet. It was SO amazing and worth every penny! When I told Edison there is an infinity pool with a beautiful view of the marina, he was so excited. 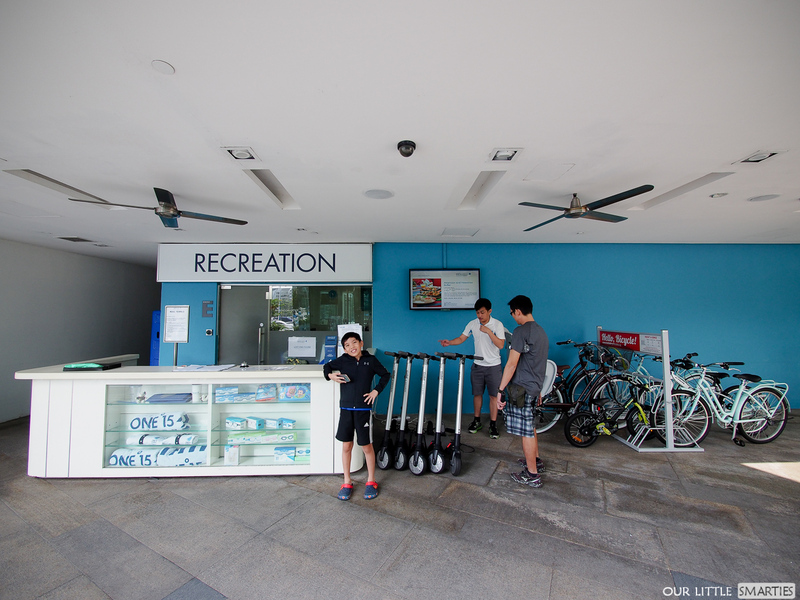 The pool is located at Level 1 along with other children’s facilities including game arcade, air-conditioned playroom, outdoor playground (with trampoline), and bicycle and e-scooter rental counter. 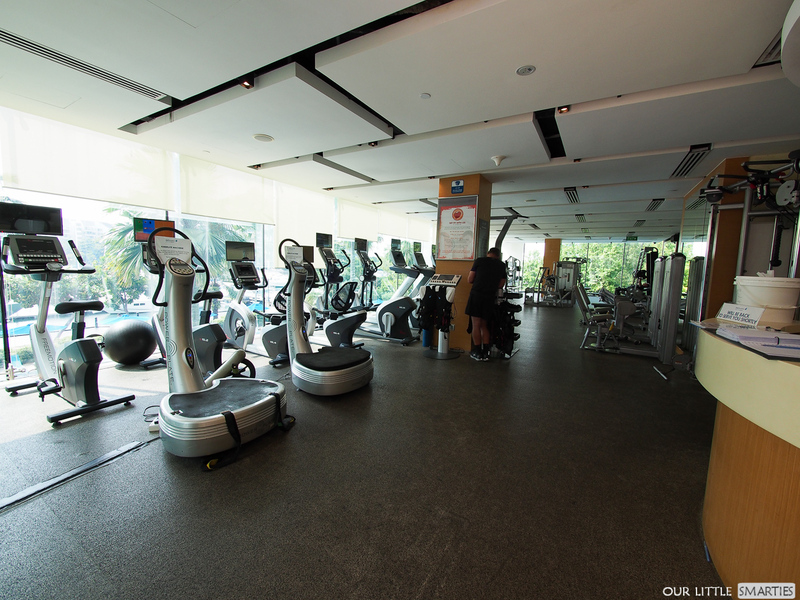 Fitness center is located at Level 2 overlooking the pool. Sentosa Cove!  We’ve heard so much about it – sparkling ocean, swaying palm trees, serene and upscale surroundings, playground of the rich and famous. It all sounds so untouchable! But wait, that’s not true! 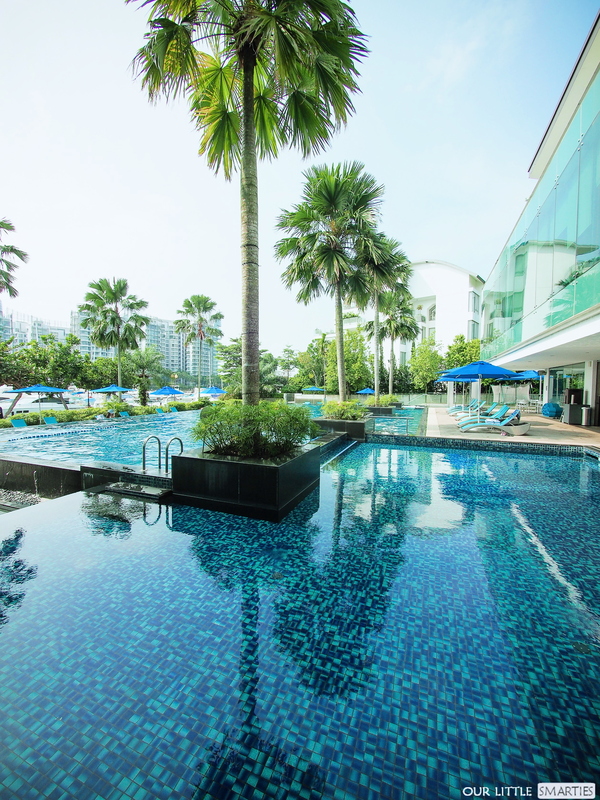 ONE°15 Marina offers you a luxury Sentosa Cove staycation without busting your budget. 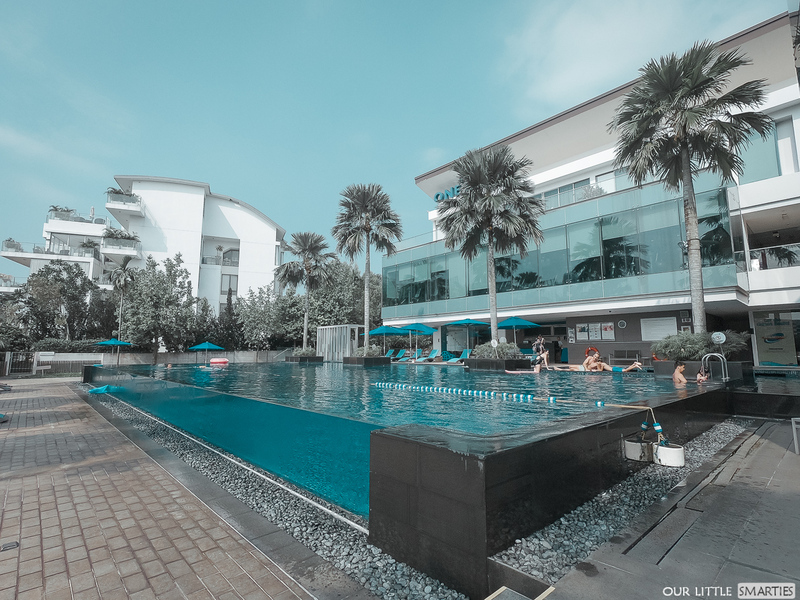 It’s quite affordable as compared to other hotel in Sentosa Cove and even hotels in Sentosa Island itself. With the Family Fun offer, you can book a room with breakfast and extra bed for your child from just $188+. This promotion is valid from 1 July – 31 Aug 2018, so act fast before it ends. Alternatively, use promo code STAY115 to enjoy 15% off. 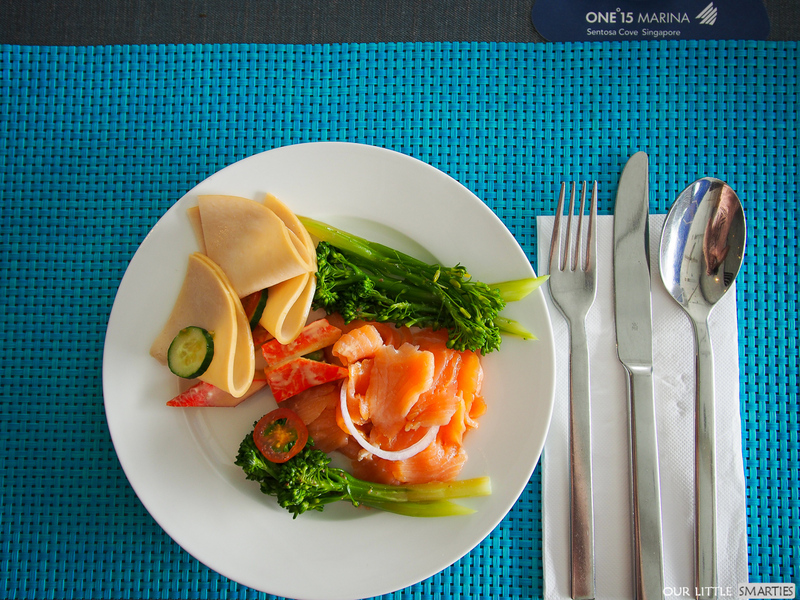 If you’re looking for a refreshing change to your usual city staycation, I’d highly recommend ONE°15 Marina Club. It was such a great staycay – enjoying fresh air in the open balcony with a marina view, indulging in a relaxing bathtub soak before retreating under the covers to recharge. Additionally, the warm and attentive service from their staffs continually won our hearts. 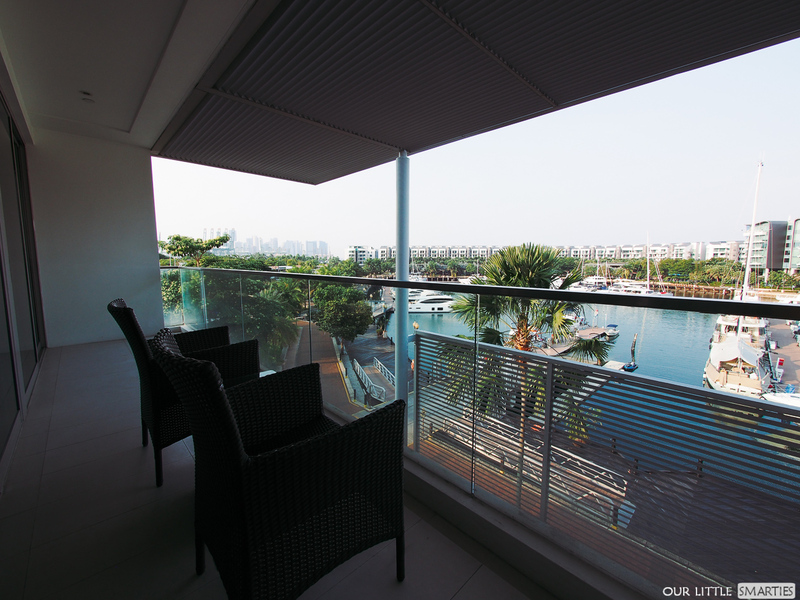 We promised Edison that we will return to ONE°15 Marina Sentosa Cove again soon. Disclosure: This is an invited media stay. Our commitment is honesty and fairness. Opinions as always are our own.